Game birds are among some of the UK’s most underrated but flavourful resources and they’re in season right now. We talk to Adam Gray and find out a bit more about the different species available. Britain’s rich and varied landscape of rolling fields, dramatic coastline and ancient woodlands has gifted us with a plethora of fantastic furred and feathered game species right on our doorstep. Game birds such as grouse, pheasant, partridge, snipe, wild duck and woodcock have thrived and bred successfully in this environmental diversity, feeding on the countryside’s bountiful resources of food. By default, game is inherently sustainable, natural and free-range, making it an attractive alternative to farmed meat. ‘Game should be put in the same category as English strawberries, English asparagus and Jersey royal potatoes. Only eaten in the correct season,’ asserts Adam Gray, Michelin-starred chef and fervent champion of seasonal, British ingredients. Not only is game sensationally ‘seasonal British produce’ it is also ‘low in fat and high in protein,’ making it a healthy alternative to more widely consumed red meats such as lamb and beef. 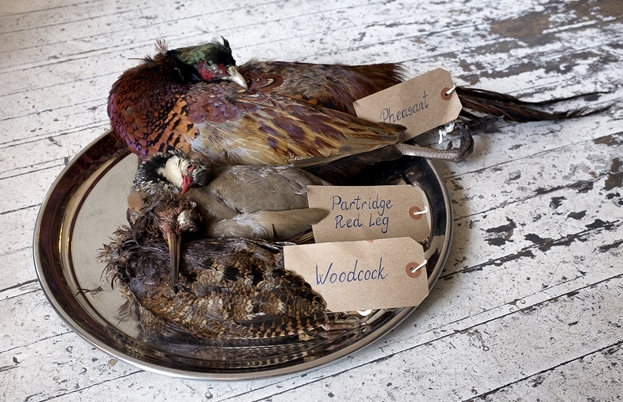 What’s more, wild game feeds on a naturally foraged diet which makes the meat leaner and imparts a unique flavour. 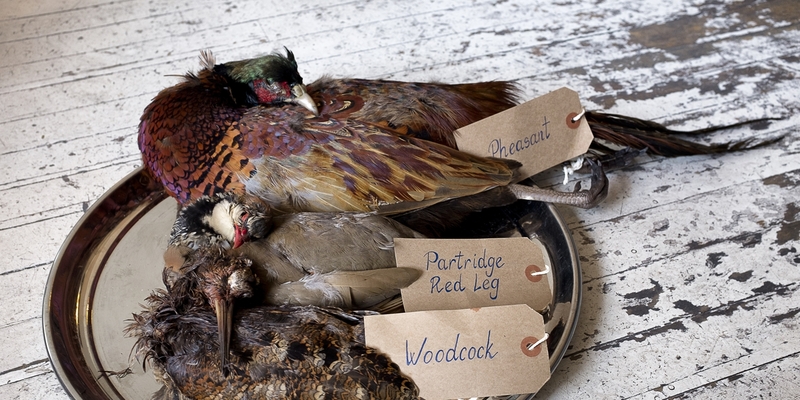 The flavour of game is intensified by being ‘hung’ after shooting, giving it its distinctive gamey taste. When sourcing or buying game birds, Adam recommends finding a ‘local butcher or game dealer to ask their advice on what you actually want,’ and if you are new to game you can ‘ask them not to hang the bird for too long so the flavour is not too intense’. The texture of the meat does benefit from hanging too as it reduces the toughness sometimes associated with wild game. Therefore, it is always worth sourcing meat that has been properly hung. It is really not that difficult [to cook game] – if you can roast a chicken, you can cook a game bird! Whichever way you decide to cook your feathered game, we have put together a comprehensive guide to help you make the most of this marvellous seasonal British produce. 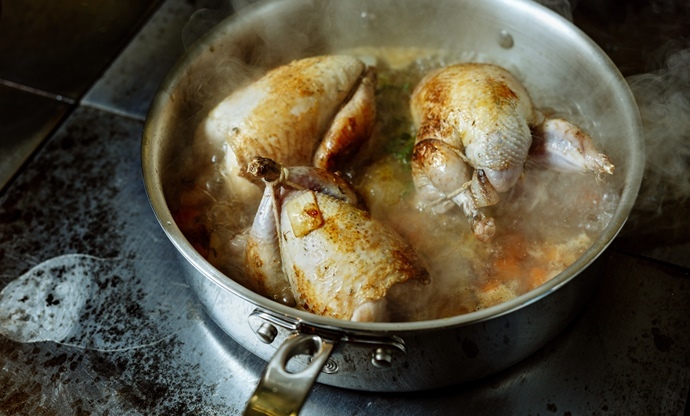 'Heathery' and rich flavoured due to its exclusive diet of heather on the moorlands of northern Britain, grouse is one of the first game birds to become available on 12 August (also known as the ‘Glorious Twelfth’). So-called 'young' grouse are born early in the season and their lean dark meat is more tender and delicately flavoured than that of the 'older' grouse available until late December. This means that the young grouse are more suited to pan-frying or roasting, whereas the older birds require a longer cooking time to give the slightly tougher meat time to soften. The best way to tell the age of your grouse is by spreading out its wings. If the feathers are rounded at the end the grouse is old, whereas if they are pointed then the bird is young. The strong gamey flavour of grouse pairs perfectly with the sweet and sour notes of blackberries as well as seasonal vegetables like beetroot. Game should be put in the same category as English strawberries, English asparagus and Jersey royal potatoes. Only eaten in the correct season. As the largest species of wild duck found in Britain, mallard is the most commonly used wild duck in restaurants up and down the country. The season for mallard spans from 1 September to 31 January and makes a wonderful meat for the winter months. Wild mallard has less fat and is stronger in flavour than its farmed counterparts. The flesh has a distinctive rich, gamey flavour which works particularly well with fruits such as oranges and cherries. While the meat is leaner, this does mean that certain cuts benefit from marinating for up to 24 hours. A whole duck is delicious when simply roasted in the oven, whereas pan-roasting is a great way to cook the breast meat and the legs lend themselves to being slow-cooked, braised or confited. The most well-known and plentiful game bird in the UK. The pheasant shooting season commences on 1 October and lasts until 1 February, with wild bird stocks replenished with the introduction of farmed pheasants in the summer months. Large with a long tail, the flesh has a subtler flavour than many game birds, making it the ideal choice for those taking their first plunge into the world of game. The majority of the pale flesh is found as breast meat, which is the more tender meat on the bird and perfect for quick cooking. Younger pheasants are ideal for roasting whole in the oven, whereas cuts from older birds are more suited to stewing and casseroling. The best way to age your pheasant is to look at the spurs. If it is an old pheasant the spurs are dark, hard and sharp compared to the lighter, blunter and softer spurs of a young pheasant. 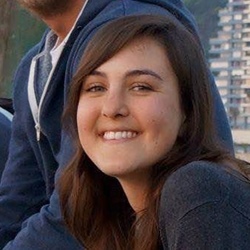 [Find] a local butcher or game dealer and ask their advice on what you actually want. There are two types of partridge – red leg and grey leg. Red legs are larger than their grey legged cousins, and were introduced to the UK from Spain and France. Both are in season from 1 September to 1 February, but the native grey partridge (regarded by many as having the superior texture) is harder to come by. Whichever species you try, both birds have delicate meat without a strong gamey flavour. Being a particularly small game bird, one partridge is the perfect size to serve one person as a main course. Indeed, younger birds are delicious when roasted whole and in the pan. A small wading bird with a long, needle-like beak, the snipe lives in British wetlands and is closely related to the woodcock. They are very small game birds and extremely hard to catch as they fly in a ‘zig-zag’ pattern (which, interestingly, is where the word sniper stems from). Due to their small size snipes they are normally roasted whole, with the beak pierced through the body. Like the woodcock, the innards of the snipe can be left in when cooking, really adding to the flavour of the final dish and are particularly delicious when spread on toast. 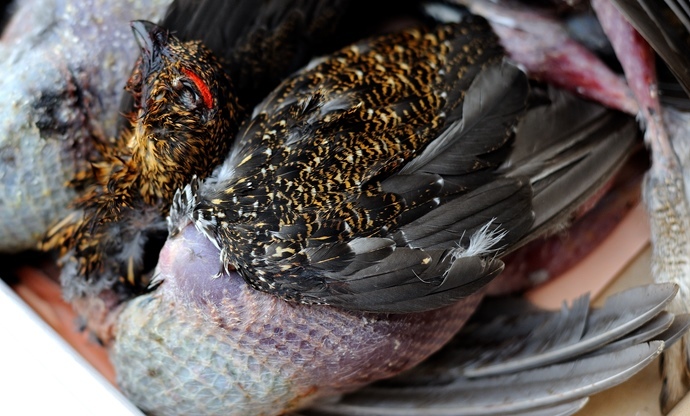 Available from 12 August through to 31 January, this is a true wild game bird. Small dabbling ducks, teals are the smallest wild duck species in the UK. 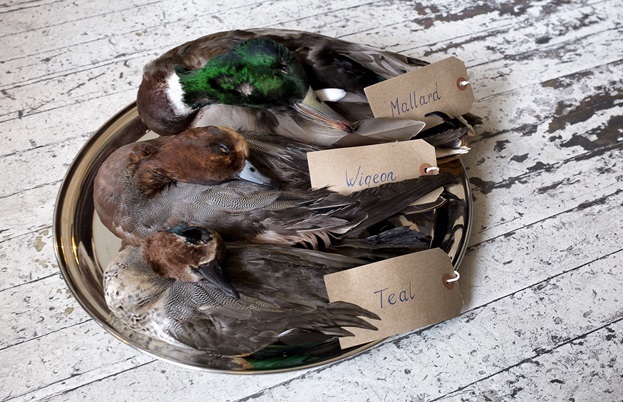 The teal is in fact widely revered for its texture and taste, being gamier in flavour than other larger wild duck species including the mallard. As it is only a small bird, teal is suitable served whole as a portion for one person, however those with larger appetites may prefer more. 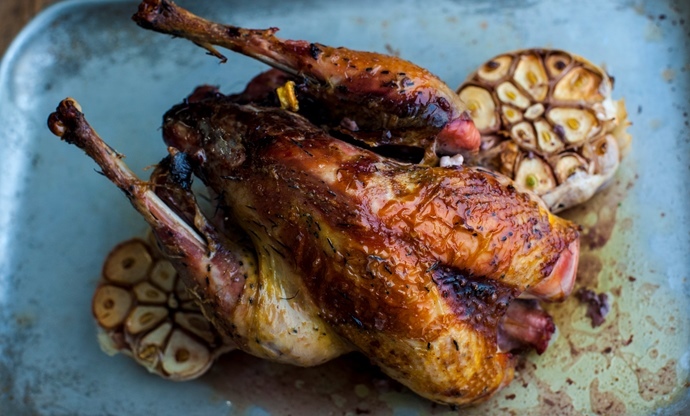 Roasting it whole in the oven is the best way to enjoy this dainty wild duck. The wigeon (or widgeon) is a medium-sized wild duck species which migrates to the UK in winter from the far-flung reaches of Iceland, Scandinavia or Russia. Inhabiting the waterside pastures of Britain over the winter months, this game bird is in season from early September to late January. It’s best cooked by first removing the legs and confiting them, then poaching the rest of the bird in chicken stock, before crisping the skin up in a frying-pan. A large, mostly nocturnal wading bird with a very long straight bill, the woodcock is a highly prized game bird due to its rich and delicious flavour. Most of the woodcocks found in the UK are resident all year round, but some migrate from Finland and Russia over the winter months. Unlike most other feathered game, the head, feet and viscera (guts) of the woodcock are left intact when butchered ready for cooking. This process really elevates the flavour of the final dish, as the viscera liquidise during cooking to give a delicious sauce. This is especially true when slowly cooking the bird in a casserole or stew. The season for woodcock is from 1 October to 31 January. It can be difficult to get hold of, but it is definitely worth the effort.